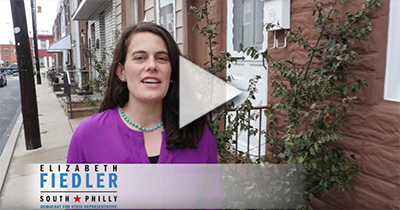 Philadelphia, PA — This afternoon at 4:30 in Dickinson Square Park, Elizabeth Fiedler, former community and political reporter for WHYY, announced her intent to run in 2018 for state representative in the 184th district. A resident of South Philadelphia, mother, civic group member and advocate for her local public school, this will be her first time running for office. As a Pennsylvania state representative Fiedler will put working families first. She plans to make universal healthcare and public school funding top priorities when she’s in Harrisburg. “As a parent committed to raising my family in Philadelphia, I believe Elizabeth will advocate for our community in Harrisburg.” Christopher Dascher, father, mail carrier, lifelong Philadelphian. Fiedler can also be followed on Facebook and Twitter .